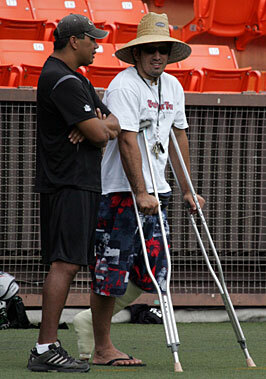 Injured UH linebacker Blaze Soares, right, attended yesterday's practice. Several running backs, including senior David Farmer and freshman Joey Cadiz, were also on crutches. It may be a good thing the Hawaii offense uses just one running back. The Warriors backfield has taken some hits in fall camp and the most experienced of the group went down with an injury during yesterday's practice. Senior David Farmer left Aloha Stadium on crutches with his right knee wrapped after suffering an injury on a running play during the 11-on-11 team period. Farmer said he'll have an MRI, "but we don't know much more about it yet." Farmer has carried the ball just 33 times in three seasons, but he started six games last season and carved out a niche as a solid blocking back in UH's pass-first system. "I'm real concerned about Farmer going down," UH coach Greg McMackin said. "He's very valuable to our team and I'm anxious to see what his situation is with his knee. He's valuable on all special teams and he's a great fullback." Junior Leon Wright-Jackson has been first in the rotation in the Warriors' one-back alignment. Joey Cadiz, a freshman from Mililani, was also on crutches yesterday after suffering a sprained knee in Wednesday's practice. Cadiz is also awaiting the results of an MRI. Jake Heun hasn't practiced since the first week of camp due to a back injury and isn't sure when he'll be able to return. The injuries also mean more work for senior Khevin Peoples and junior Jayson Rego. "You can never be satisfied with where you're at," Rego said. "You just try to get better than you were the day before. I'm never satisfied. I just have to keep working hard and keep pushing myself." The Warrior Football Kickoff Rally scheduled for today at Tamarind Park has been canceled. UH received a ruling from the NCAA that the Warriors were prohibited from participating since the rally would be held on a commercial property. With Solomon Elimimian (ankle) and Adam Leonard (hamstring) sitting out practice, the first linebacker unit yesterday was R.J. Kiesel-Kauhane, Brashton Satele and Tyson Kafentzis. Junior Blaze Soares, with a cast protecting his injured calf, attended the practice. ... The Warriors ended the practice by unveiling their new ha'a, led by defensive lineman Keala Watson and safety Keao Monteilh. ... The Warriors have their last set of two-a-day practices today. They are scheduled to practice tomorrow from 7 to 10 a.m. on campus.